Thats-a one-a good meatball-a! Ok so that was my Italian accent. These are actually Swedish meatballs though, not Italian, but I’m not exactly sure how to type a Swedish accent. Use your imagination. Anyways! These meatballs are a delicious and low-fat meal! I’ve made them several times, and we love them! The gravy is what makes them so good. It makes an excellent sauce for the pasta as well. One thing I really like about this recipe is that it uses very common ingredients, to make a not-so-common entree. 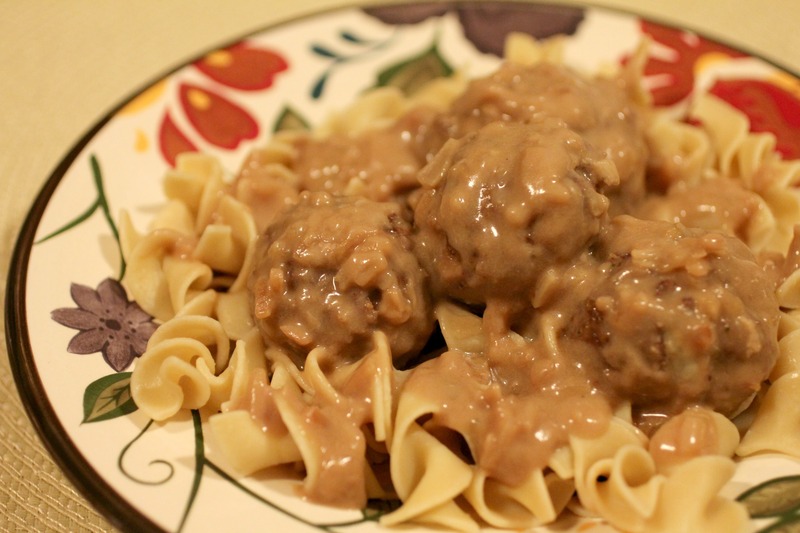 Just beware of one thing…you have to cook the meatballs BEFORE you’re ready to do the gravy. 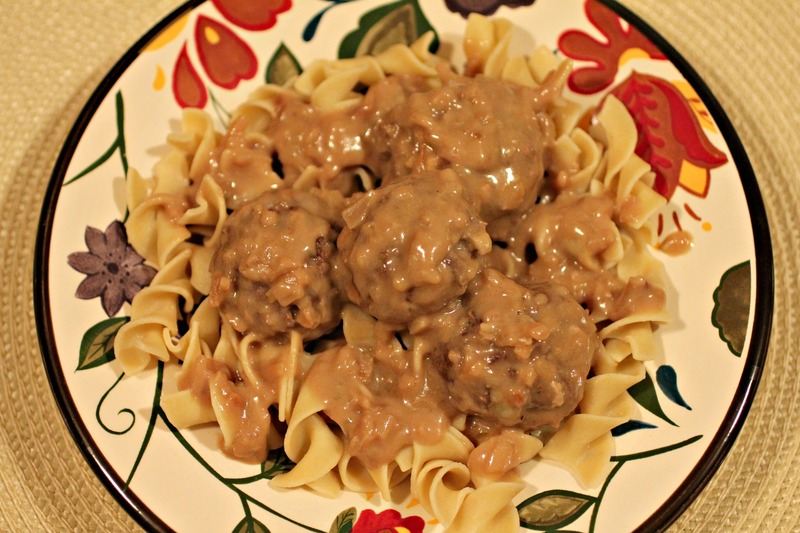 When I made these, I thought that I could cook the gravy while the meatballs were in the oven, but the gravy has to have the already cooked meatballs in it. So that makes this dish take a little bit longer (about an hour total). I also wanted to let you know to stay tuned to Normal Cooking this week because I’ll be doing my very first ever GIVEAWAY!! Keep checking back to see what amazing product I’ll be GIVING AWAY soon!! Mix all meatball ingredients together. Form into 1″ balls. Place in 8×8 pan and bake for 30 mins. In large skillet, mix together the onion soup mix, water, flour, and milk. Add cooked meatballs to skillet. Simmer for 20 mins, stirring occasionally. Serve over 8 oz. egg noodles, cooked according to package directions. 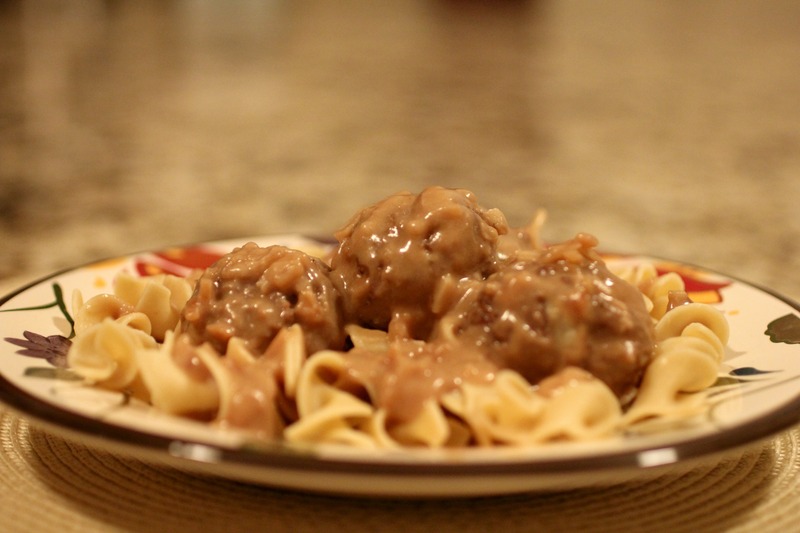 I’ve been wanting to make some Swedish meatballs ’cause I haven’t made them in the longest time. Perfect timing for me Lindsay – thanks!! You’re welcome Cecile! Hope you like them! This looks amazing! I will be making this soon! Yummms! Thanks JKM! Let me know what you think! Thanks for the feedback, Anita! I’m glad you and your fiance love it. And thank you for recommending my site to your friends. I hope they find recipes they love too! Going to make these for my family tonight. Can’t wait to try them. Thanks Stacie, hope you like them!